grubb1937: Are cycle paths necessarily a good thing? Are cycle paths really a good thing? The reason I pose this question is based on a recent experience. In my misguided and limited understanding of the National Cycle Network, I believed that the development of cycle routes and the work by the Sustrans charity was a good thing. I have to confess that most of my experience of riding some of the Sustrans routes has been in the countryside, not in a urban environment. I had occasion to use part of NCN9/91 from Whiteabbey to Belfast over the summer. The problem for me, was that part of the cycle route uses a footpath into Belfast. The idea behind the development of cycle routes seems to be to encourage more people to cycle, by moving bicycles off busy roads onto quieter byways and out of potential conflict with motor vehicles. A laudable notion, but as worked out on the ground in local areas, does this represent best practice acting in the best interests for cyclists? In this instance, by moving cyclists off the public highway and onto footpaths replaces one type of hazard with another. My experience of using the cycle route from Whiteabbey to Belfast was unpleasant to say the least – I would rather ride a bicycle again through Paris. In the first instance, I encountered a pensioners walking group who had just emerged onto the cycle path and filled the width of the path like a herd of bullocks. The walk leader (?) was engrossed deep in conversation, as was most of the group of largely female members. A loud bell (Lion Works) rung repeatedly as I approached brought no response until I drew close to the front of the group, when a warning shout of 'bike' was given. It had little effect on the group. Rather than keep to one side of the path, the group panicked and split up, so it was like a reverse game of skittles, trying hard not to be brought off the bike. I am not against older people being active, nor meeting up socially to exercise together. It is a win, win situation. However Newtownabbey Borough Council actively promote the cycle route locally for walking, so are increasing the number of pedestrians on the route. Try negotiating this with a loaded touring bike, panniers etc – should create a favourable impression for visiting cycle tourists who want to enjoy the views over Belfast Lough, but find themselves having to try and dodge pedestrians. The question I have for Sustrans is this, how does this policy adopted by one of their partners encourage cycling and develop the cycle route for commuting into Belfast? Is this the best way of increasing the number of bicycle journeys, which is meant to be part of a sustainable transport policy? Another problem is dogs running loose off the lead and dog fouling. The law was changed in Northern Ireland to make it an offence not to have your dog on a lead on a public road. (This should prevent you being chased and bitten by a dog while riding on the road!) 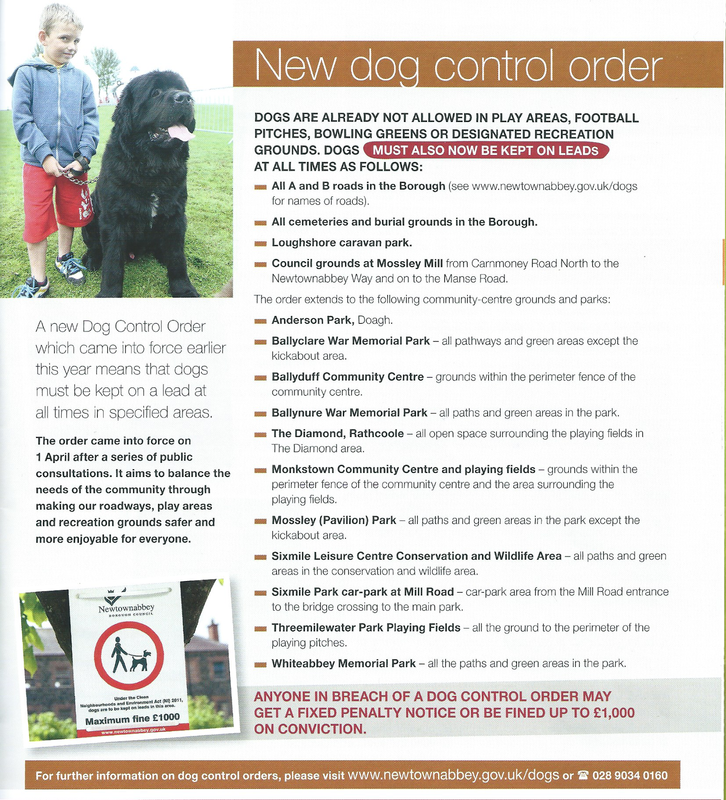 The local councils were given responsibility for this legislation and have also designated other public areas where dogs must be walked on a lead. Newtownabbey Borough Council have responsibility for the Whiteabbey end of the cycle route, but have decreed that you don't have to walk your dog on a lead on the cycle route??? My sister is currently nursing cracked ribs having been brought off her bike by a dog running loose on her local cycle route riding to a meeting place for her usual Saturday morning club run. I must point out, this was not in Newtownabbey Borough Council area, but I use it as an illustration as to what can so easily happen. It is hardly safe practice and not conducive to making the shared footpath safer for cyclists. How many of the people who took this decision actually use a bicycle for transport? - Is the Northern Ireland transport policy really joined up? A further problem is that many pedestrians/joggers using the footpath use an MP3 type player or mobile phone to listen to music.....they are tuned in to their music, but not much else, so can't hear a bicycle bell or warning shout. Again, I speak from experience. I prefer to ride on the left, as this is the norm on the road in this part of the world, but using these footpaths you have to learn to weave to avoid other users of the path. (A definite need for spatial awareness software upgrades). I contacted both Sustrans the charity responsible for the cycle route and Newtownabbey Borough Council about the incident with the walking group. Sustrans response to my email was in my humble opinion pathetic. The Sustrans 'Code of Conduct' for using their footpath cycle routes which formed the main part of their reply, is available on the link. The Borough Council stated they would investigate the walking group incident and get back to me, only didn't, hence the blog post months after the incident. They did however respond to my enquiry about the dogs legislation and confirm there was no legal requirement to have a dog on a lead on the cycle routes in their Borough, nor are there any council bye-laws governing the use of these footpath cycle routes. From the available evidence it would appear that Sustrans in obtaining funding and working with partner agencies to develop 'cycle routes', are creating some routes which are less than ideal for cyclists and from Sustrans own policy, cyclists appear to have few if any rights, rather all the responsibility is placed onto the cyclist. (Is this really a realistic way of encouraging cycling and how are you meant to "relax and unwind"?) These cycle routes replace the hazard from motor vehicles with another real hazard from pedestrians and dogs running loose. I think that the idea of developing cycle routes is very commendable, but I would much prefer to see this done in a meaningful cyclist-centric way, that supports and protects the interests of cyclists but does not endanger or alienate other interest groups. Encouraging bicycle use for transport and recreation, by reducing hazards on public roads - using bus lanes etc, ensuring that bicycles as vehicles are not marginalised and pushed off the public highway, seems to me a better solution. A bicycle is a vehicle and where it is deemed necessary to share a footpath, it should be clearly segregated to protect and ensure the safety of all the users of that space. Common sense really.